Cast: Christian Bale, Hugh Jackman, Michael Caine, Scarlett Johansson, David Bowie, Andy Serkis, Piper Perabo. Directed by Christopher Nolan, written by Christopher and Jonathan Nolan. Running Time: 2hrs 8 minutes. 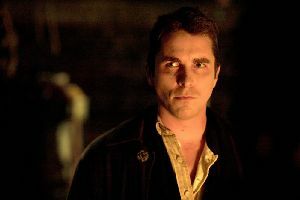 The Prestige is a complicated tale that, despite a poorly worked plot, still manages to deliver as a tense and compelling movie. Christian Bale and Hugh Jackman star as stage magicians, each trying to outdo the other in a lifelong personal grudge match. Christopher Nolan, director of cult favourite Memento and last year's Batman Begins, creates a dark antique London for the stars to play in and keeps a rapid pace as there's a lot of plot to get through. The time jumps can be confusing, with it occasionally being less than obvious when we've delved into a flashback scene, and there are so many of them that the whole timeline of the movie can be lost without careful attention. The plot itself is convoluted and deliberately misleading, in a parallel with the subject matter itself, but some of the clues are just a little too heavy-handed, so that most of the twists are revealed to the viewer earlier than the author intended. One of the twists, in fact, was so evident from the first second of it appearing, that I wasn't even aware it was supposed to be a twist until Bale gleefully explained it in the final act. Some work to be done there, then. Bale and Jackman (who I'm sure you remember as Wolverine from The X-Men) are both excellent, and they receive first class support from the ever-reliable Michael Caine and, in a surprising but effective casting decision, David Bowie as a largely factual version of the real scientific pioneer Nikola Tesla. Both the leads have their character flaws, which helps keep things interesting, and it's genuinely interesting to see where they're going - it's just a shame that the plot isn't polished enough to match the rest of the movie. When Hugh Jackman decides he needs a doppelganger to pull off a trick, he just goes out and finds one. And he's Hugh Jackman with different facial hair. And he just happens to be an out-of-work actor. Oh come on. Imagine how long it would take you to find someone who looked exactly the same as you. When they throw this kind of crap in the story, it sullies the rest of it - which is a shame because it could have been an excellent movie without these flaws. The final plot revelation is a tad vague too, which is quite a contrast to the other easily spotted twists. I actually thought they'd created a massive plot hole until I read up about it afterwards, only then discovering a subtlety to the plot that I'd missed at the time, despite concentrating! I guess this is one movie that will fit together better at a second viewing. Trouble is, after the second viewing, you'll be thinking, "now why didn't they do so-and-so..."
The Prestige is very good - though not perfect. The copious amount of talent makes up for the chunks of plot that won't stand up to questioning, and there's plenty to talk about on the drive home. Well worth your attention - and make sure you give it plenty or you'll lose track of which cup the ball's under. To enjoy this film you should: not think too hard about the plot detail. The Prestige was released in the UK on 10th November.